Gingerbread cookies are a Christmas tradition at our house but my “traditional” recipe called for shortening. I tried substituting coconut oil one year but it made the dough too hard and the cookies just weren’t the same. Needless to say I was glad to find this recipe! My daughter and I made these with a few substitutions and they came out great! I wanted to post this just in case someone wanted to try our variation-We used Organic Sprouted Spelt Flour in place of all purpose, Organic Coconut Sugar in place of brown sugar & Organic Honey in place of molasses. We did not ice the cookies because my family prefers them plain! 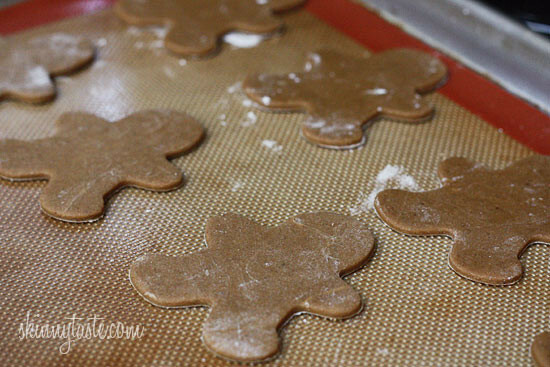 =) This is our new traditional Christmas Gingerbread Cookie recipe! Yay! Thank you!!!!! I substituted 1 c of whole wheat flour for 1 c of the white flour. I also added more spices (nutmeg, black pepper, more ginger) and I added 3 T crystallized ginger. I refrigerated the dough for 1 hour prior to rolling. Then, after I cut out the shapes (I used hearts), I froze them on the cookie sheet for 15 minutes before baking. For the icing, I used meringue powder, a few drops of almond extract, and powdered sugar (on the packaging for the Wilton meringue powder). The cookies were soft and delicious. 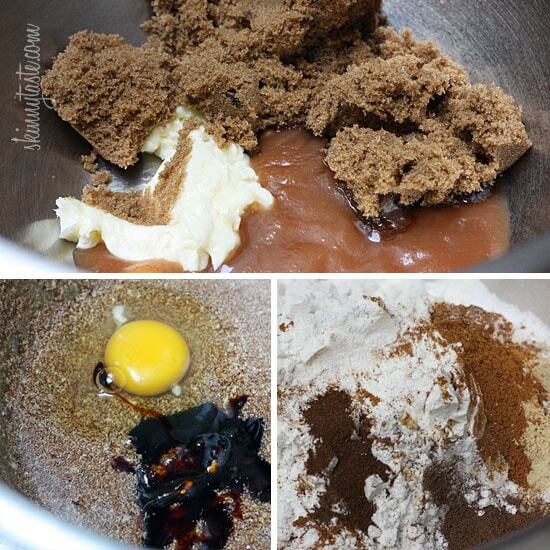 I love my gingerbread with a kick, so the extra ingredients really added to the flavor. This one’s a keeper. It made 32 hearts and each has under 100 calories and just one gram of fat (I logged the recipe on My Fitness Pal). Thanks for posting the recipe! With the little bit of butter, I had a feeling they would be great. This recipe is amazing! I have gallstones yet this was safe. I’m never using another recipe. Turned out so well. Do you know the smart points value by chance? Had to add a ton of flour, so spices were deluded. Once the correct amount of flour was added they rolled out nicely. Also used fresh ginger. Hi! I'm just making these cookies now and for some reason my dough is sticky?? Is that normal? I just put them in the fridge to chill will they firm up after that? I made the recipe without the butter and it turned out beautifully! I used a Splenda-type brown sugar mix instead of brown sugar-I'm diabetic-and a little more flour and iit worked perfectly! I baked them on a tin foil lined baking sheet sprayed with Baker's Joy and they turned out beautifully. I really tried to make this recipe work for me. The dough requires lots of patience. I just was just too sticky even with more flour dusted and keeping it chilled. I got a few cookies out of it and was very tasty -I just wish they would of rolled out a little easier. Most of my recipes from this site are AMAZING but this one was a miss for me. O well! I will just have to make the full fat ones and count the points. I am chilling the doughs however I feel that they are wet and don't have a doughy texture at all. Am I doing anything wrong? LOVE THIS ! Great recipe ! i've tried a few but this one tastes great ! Love so many of your recipes ! Just finished making these and they turned out great! I did however have to to add more flour and spices. my tip- follow the recipe and then cook a couple of cookies from the dough. you can then taste what the cookies are like and if you need to add more flour and spices then you can. I would just like to know if these cookies freeze well on e they have been baked? I have not iced them yet. Just made these with the kids. They wouldn't eat them and actually threw the rest of the cookies away. I won't make the other batch that is in the fridge. I am really disappointed – everyone on here had rave reviews and called them "awesome". My original recipe calls for 3 cups of flour as well – but uses 12 Tb of butter, 3/4 cup molasses and a full tablespoon of cinnamon and ginger each. This is probably where our tastes differ. Just made these on Christmas, they were a big hit. And I feel good knowing nutrition facts behind it, thanks! I am forever saving this recipe! I'm making these right now and can't wait to show you how they turn out! A friend just sent me this link and I am so so very excited!! 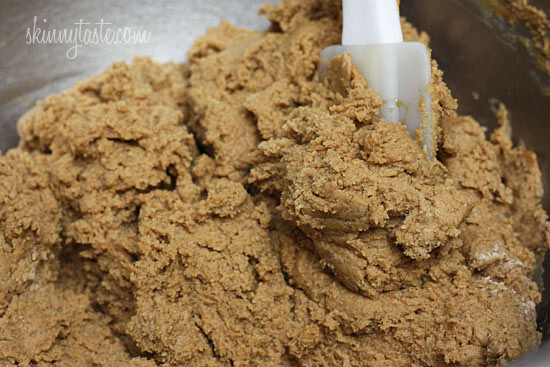 Thanks for posting this, all of my skinny gingerbread cookies have come out too soft! I made these for a cookie exchange and they were a big hit! I also saved/froze a dozen to decorate at a party with kids and they loved it (I also think they were more flavorful than the freshly made ones). I'm making them again for another exchange – this time Glutten free! My kids and I made these tonight and they were a hit! Thanks Gina for providing a more "healthier" option for Christmas! These were so cute! Really puffy and perfectly spiced. A tad dry but overall very good. Definitely need lots of flour for dusting, and chilling helped a lot. can u use anything besides applesauce? So these are downright fabulous. Pleasantly spicy. I accidentally used 4 T butter (and it was salted butter) – seemed just fine. Didn't bother rolling out for cutouts – rolled into tiny balls, then used the bottom of a drinking glass with a decorative bottom pressed into sugar to flatten them out. Great gingerbread flavor. Baked on parchment paper with no problems. Next time I'll try using part whole wheat flour. tried these out today — great! however, I did not roll it out and make the cut outs — I rolled the dough into tiny balls and made ginger snow balls — same recipe as yours except just roll the dough into little balls 1/4 -1/2 inch and then after baking (10-12 m depending on size) roll into powered sugar. even smaller (less cal) — the spice of the recipe is a great after taste. — thanks!!! could you perhaps use golden syrup instead of applesauce? I want to make these soon. I'm going to use store bought icing (because I have some in my fridge) and I was wondering, how do you make the icing harder? So it doesn't get on other cookies if you stack them? What would I add to the icing? Lay the cookies on a baking sheet after they've been iced and put the tray in the freezer for five to ten minutes until the icing is set. Or, if you're not in a rush just leave them on the counter uncovered until the icing is set. (Usually about a half an hour is good). I also find it helps to put a piece of wax paper between the cookies when stacking them. Hope that helps. These cookies are great! I couldn't wait until they came out of the oven! I definitely will be making these again for the upcoming holidays! Thank You! I thought it wasn't safe to eat uncooked egg whites? Could someone clarify this because my cookies are in the oven now! Once it's dried, there is no moisture in the egg whites for the bacteria to live or grow. So it's safe to eat. I cant wait for christmas so I can make them! I made these tonight and I loved the flavour, but I couldn't roll them out if my life depended on it =) I even added an extra 1/2 cup of flour to the dough thinking it might siffen up a bit. I didn't want to keep adding flour in case it raised the PointsPlus value too high. 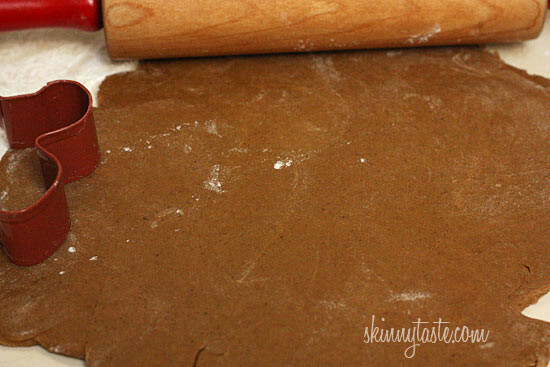 How much extra flour do you figure you used during the rolling process? I dropped the dough on the sheet and flattened it instead, and then used a straw to cut out little holes. I decorated them as buttons. I'll try again closer to Christmas. 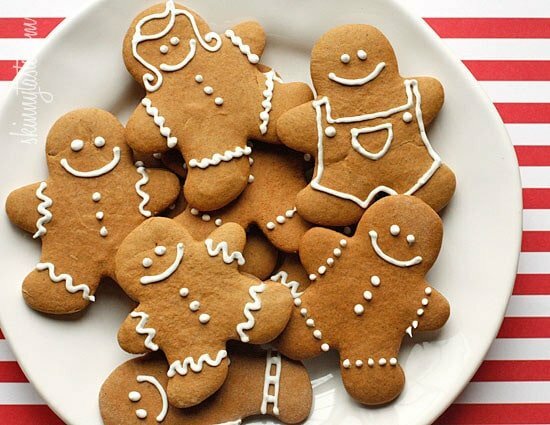 How do you make these with whole wheat flour 🙁 I would love to save this recipe and make them around Christmas time, but would like to use whole wheat flour instead. Has anyone tried this? I really need a reply. Do you think if i took out all the spices and added about 1/4 cup cocoa powder, these would make good chocolate crisp cookies? I like this recipe very much..though I have never heard of applesauce and I doubt they sell it here (turkey) is there anything else I can put in it? Is it like molasses? Could I use grape molasses for example? Hi i was thinking about doing this recipe myself and came across your comment apple sauce is like well stewed apples then chilled. I was disappointed in these. The majority of the recipes here are out of this world, but I did not think this one was good. I followed the recipe exactly, but the texture was…strange, for lack of a better word, and the flavor was very bland. 🙁 I guess this is just one of those things that doesn't work "light". I agree. I love all your other recipes. They smelled fantastic and looked nice and light, kind of like cake but thicker, but the taste was way too bland. I prefer to use the classic full-fat recipe and just watch my portions. You probably need to add way more flour to the counter and rolling pin. You could also pop it in the freezer for an hour too, or try dividing it into 4 balls instead of 2. Mine was super soft too but I sprinkled on a ton of flour and made sure ever time I rolled it to lift up the dough to make sure it wasn't sticking. My dough was well refrigerated (overnight) and was way too sticky. I dont know what was wrong. these were SUCH a hit at Christmas, everyone gobbled them up and said they were the best gbread cookies ever, thank you!!! I can't get enough of these cookies! They're so good. I found the dough super easy to work with (I felt like I could roll them out before chilling, but I still did and rolled them out between sheets of waxed paper instead of using more flour), and I thought the spice was just right with that delicious ginger zing (I used homemade applesauce, too, so there was a little more sweet/cinnamon added to mine). I'm so in love with the texture, too. No more hard, tooth-breaking gingerbread for me from now on! I'm so sad I made these to give away. I'm going to have to make more! I wanted to let you know that I have been painstakingly trying to figure out the points values for some family dessert recipes and my appreciation for your site is growing by the minute. I'm not even trying to lower the points. In short: You Rock. I've made the same gingerbread cookies recipe for years. I didn't think there could be a better one, but there is. This one! The dough was not that sticky , it rolled out effortlessly and the cookies are a kind of softer, cakelike cookie. Highly recommend these! Thanks Gina! I just made these tonight and they're delicious. Yes, dough is sticky, and even flour wasn't helping, but I remembered a trick from a fondant decorating class I took and tried using corn starch instead and that did the trick. Are these more cake-like or cookie like in texture? You know how some low fat cookies end up with almost a muffin type texture? These are going to be some of the cookies I'm making to give away as Christmas goodies! Thanks for the recipe! 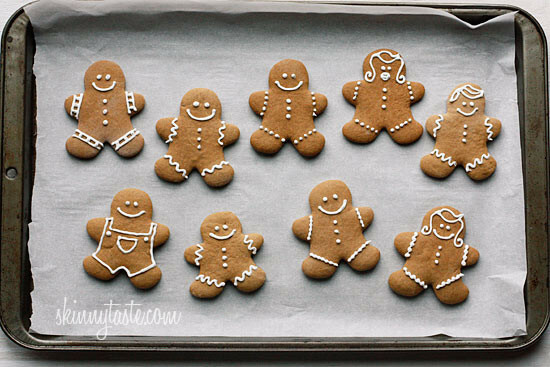 Gina, you have produced the most adorable gingerbread people I have seen – SO freakin' cute! And love that you don't have to feel guilty if you sneak one or two 🙂 Hope you have a good week, I'm sure the holidays are busy for you! can you do this recipe without cloves ? You can make them and keep then in a sealed container, they will stay fresh until Christmas. Could I make these now and freeze them until Christmas? Would love to be able to freeze them decorated if possible… they sound delicious! And the type of molasses was??? These turned out amazing and my kids had fun decorating them. What a hit in my family!!! I'm having trouble only eating 2…I want to eat them all!!! Amazing recipe. Really liked this recipe – I used my grandma's icing recipe instead (powdered sugar, drop of anise extract, drop of vanilla, drop of hot water)for a nice licorice flavor. They should work without the silpat, just be sure you don't burn them. We made these and loved them. The texture is soft and they were perfectly seasoned to our taste. We kept the dough chilled several hours, then floured the working surface as Gina mentioned and we had no problems with the dough. The kids had fun decorating them and they all loved them. Thanks for saving out waistline this Christmas! CD- you just have to use some flour to help you work the dough. Teagan, sorry they didn't meet your expectations, perhaps you would like them with more spice. Great Alison! I'm glad you liked them and they turned out good! Jenn, I let them sit out for days and they were fine. We all ate them. I have a question about the egg whites in the frosting. Are you able to let the cookies sit out or do they need to be refrigerated? Thanks! These were great, my husband is very appreciative. I didn't soften the butter enough so I warmed it up on the stove top with the apple sauce and sugar which led to a runnier consistency of dough (bit concerned) but then after it had sat in the fridge for a couple of hours it turned out great. I'm a little disappointed by this recipe. I was so excited to find a low fat recipe for these, but mine has pretty much zero flavor. I even sprinkled cinnamon on after they were done to add some flavor, and still nothing. I'm pregnant and cannot eat raw egg (egg whites).. is there some other way to make the icing? Did you use fancy or blackstrop molasses? wow! i am going to learn from you.. i always failed because i never keep the dough in the fridge…. thanks a lot for the tips. Thank you so much! 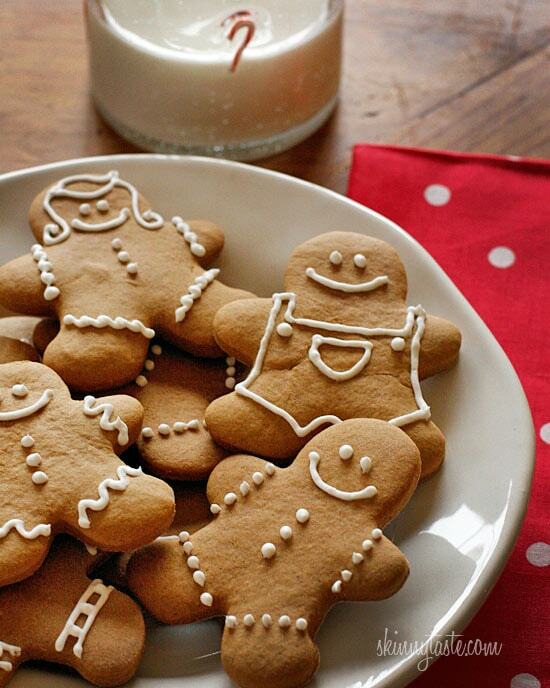 Gingerbread men are a must in our house at Christmas time, and these are just PERFECT. We'll be making these next weekend. Thanks again! I've had a really hard time with this dough after it has chilled for 4 hours. Any suggestions? Should I just let it chill some more? How cute! I love how there kind of fat little gingerbread! These look delicious. I'm trying them next week! Gina, all I can say is "you are my hero"! These will be delicious at the holiday party I'm going to Friday. Thank you a million times! These cookies are soft, not crunchy… unless you let them sit out a few days. My little one has been munching on them everyday. Parchment paper would work, but watch you don't burn them. Everyone should own a silpat!! Talitha, yes great advice. This is key!!! Well chilled dough is a must so it's manageable. Anna, sorry haven't tried with yogurt so I'm not sure if it would work. Sarah, didn't experiment with whole wheat, maybe start with half whole wheat and see. Rebecca, haven't tried it but if you do, let me know. I can't wait to try these. 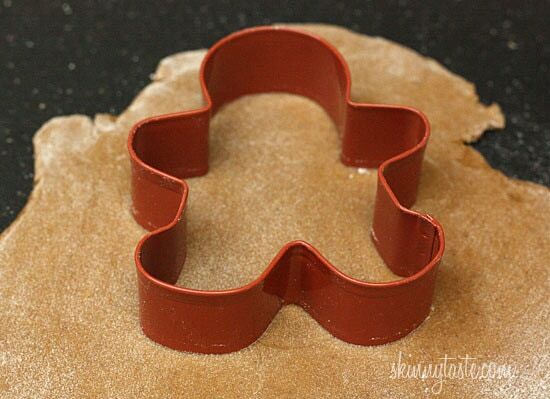 I just bought some new cookie cutters and this recipe would be a perfect one to try them out. Gina, my husband will love you for this! Those are his favorite kind of cookies! Thank you! Since I'm not a fan of the roll and cut kind of cookie, do you think I could simply make this a drop cookie? Oh, you read my mind. 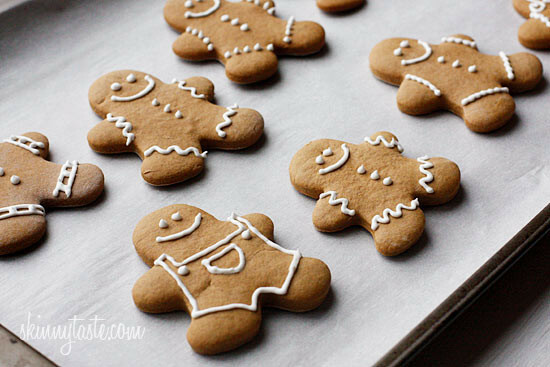 I never bake, but was contemplating making some gingerbread cookies soon in the spirit of the holiday. I'm taking this as a sign! Would whole wheat flour work with these as well? They look delicious! Sure appreciated your reply to my email during this busy season. You have MADE our Christmas cookie fun and now with no guilt!!!!!! Have avery blessed Christmas Gina! What do you think about cut-out Sugar Cookies but a skinnier version? These cookies are insanely delicious looking! Love them! I second Anna's question – are these a soft gingerbread or a crisp one? I don't mind either type – but I'd like to know! Thanks! Also: this may seem like a silly question, but is the finished product a soft, chewy cookie? Because I LOVE gingerbread cookies but hate when they are crispy! I was JUST thinking last night that I was hoping you'd post a gingerbread recipe! You're a mind reader. Your website has become an absolute staple to me and I can honestly say that 90% of the meals I've made in the past month and a half have been from your site. And I haven't had a bad meal yet! I am so excited to try these; thank you! My only question is: could I replace the applesauce with yogurt instead? I've replaced butter with yogurt or applesauce before, and always thought the nonfat yogurt (would Greek work?) lent a richer flavor than the applesauce–plus with yogurt you get some protein! Do you think it would work — and if so, would the amount be the same? Thanks! I love your recipes! I find that refrigerating every step of the way helps a LOT. Keeping the dough as cold as you can have it (without freezing) makes it the easiest to work with and results in nice clean shapes. Mix up the dough, put in the fridge for ten minutes. Roll out each section of dough, put in the fridge for ten minutes. Use the cookie cutters on the rolled dough, put in the fridge for ten minutes. (Preheat the oven at this point.) Pull the uncut dough away from the cookies (instead of the other way around), ball up the leftover dough, put in the fridge for ten minutes. So on, and so on, and so on. I do that with all cutouts! Works great. Also helps keep cookies from spreading so much. Once you roll the dough out, you can cut them in any shape, even a house! Aren't they cute! I can't take the credit for the cute decoration, my talented little cousin loves decorating ginger bread people and she got the job 🙂 And what a great job it was for a 16 year old! You read my mind! I'm pregnant, and I discovered that gingerbread cookies are one of the few things that help to settle my stomach, oddly enough (I'm guessing it's the ginger). I was planning to make some cookies this weekend, but was mourning all that butter. So, Thank you, Thank you! 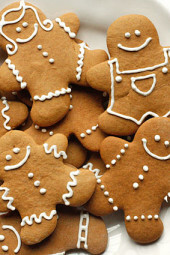 I love gingerbread cookies, they are one of my favorites for the Holiday Season! Thanks so much for posting this! PS the cookies look adorable! I was going to make regular Gingerbread cookies this weekend, however, now that you put this out, I'm swapping my recipe for this one! THANK YOU!!!!! (for decoration though, we found "glitter gel" in the cake section….my daughter LOVES anything glitter so we're going to glitter up our g-bread people! Thanks for all the recipes you post…. you make it SO easy to follow weight watchers without pain. Do you think this recipe would work for a gingerbread house?